HERE ARE THE LATEST PICTURES to be added to Eyewitness in Manchester. I'm also including a book mini-review. 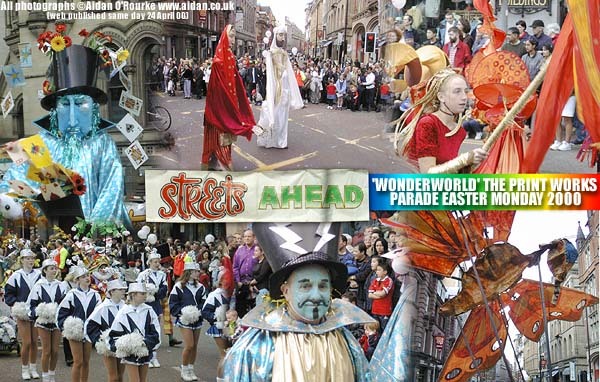 THE STREETS AHEAD FESTIVAL 2000 started in a riot of colour on Easter Monday (24 April) with a parade from the Printworks leisure complex (open in Autumn 2000) to Manchester Town Hall, on Albert Square. Streets Ahead is the largest free street festival in the United Kingdom, and in 2000, there are an amazing number of events taking place across Greater Manchester. 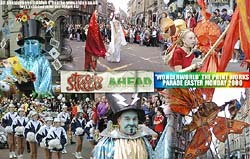 These photos, taken towards the end of the parade, give just a small sample of the sights and sounds on offer. DOVE STONE RESERVOIR is only 9miles (14 kilometres) east of the centre of Manchester, and is a popular place for walking cycling, boating, fishing and just admiring the scenery. There are two reservoirs here, a smaller one, Yeoman Hey, built around 1880, and the main reservoir built in the mid 1960's. It's now owned and operated by North West Water. In the south west corner, the water falls into a gigantic conical funnel, and is piped for treatment in nearby Mossley. THESE SIGNS can be seen on the footpaths around Dove Stone reservoir. 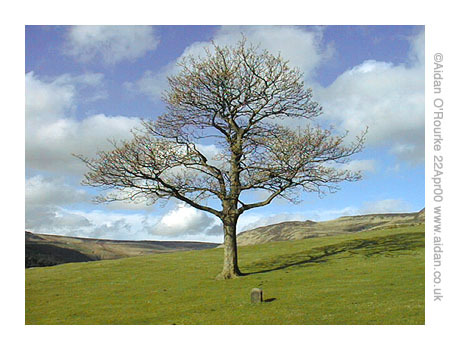 The land here belongs to the Peak District National Park, one of three National Parks in England and Wales. There are regulations which visitors have to obey, as we can see here. Much of the land is privately owned, but is open for use by the general public. AND I SHALL CALL YOU..."TREE". Taken on Good Friday, 21 April 2000, this tree still has no leaves - it stands on the hillside overlooking Dove Stone reservoir. The windswept location gives the tree a primeval quality. Is this a lone surviving tree from what was once a forest, or has it always stood alone like this? In the distance, Saddleworth Moor is just visible. Soon this tree will be sprouting leaves. 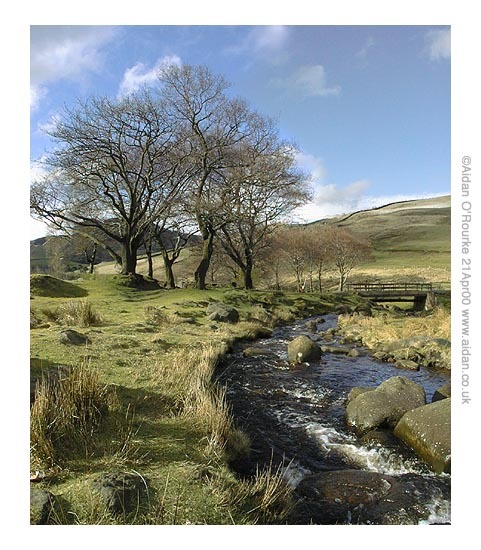 This stream flows into Dove Stone reservoir, east of Saddleworth, in Oldham MBC. The icy cold water is a peaty brown colour from the moors above. The reservoir is just beyond the trees to the left - the path leads across the footbridge to the right and around the reservoir. GOODBYE PICCADILLY. At around Easter 2000 Piccadilly is in the process of being dug up, in preparation for the implementation of Manchester City Council's redevelopment plan. An office block will be constructed on the area directly in front of us, obscuring views of the Portland Thistle hotel to the right, and reducing the amount of open space in a city centre already deprived of green areas. To the left, the sunken gardens will be filled in, a concrete contemporary Japanese style pavilion will be built, and there will be walk-through fountains on the Oldham Street side, traversed by a hump-back footbridge. Several statues will be dismantled and moved elsewhere. Check back to see this scene in 2001, 2002 and later. THIS IS A composite panoramic view which runs from roughly north east through east to south east Greater Manchester. The photos were taken from the 12th floor of Manchester University Mathematics building, on Oxford Road. 1) The white building is the Maths & Social Science Building of UMIST (University of Manchester Institute of Science and Technology). 2) The recently constructed multi-storey car park for the Commonwealth Games pool looks clean and contemporary in the lower foreground, but from close up, this building reminds me of a giant rabbit hutch, with its grey mesh grilles mounted on bare concrete. 3) The giant white cylinder of the former gas works at Beswick will soon disappear from this scene - in April 2000 dismantling is underway. A potent symbol of 19th century, and the 'energy revolution' which powered the industrial revolution, will only be visible in peoples memories, and in photos, including mine. 4) The curved roof of the Manchester Velodrome is just visible here - and within a few months, the outline of the Commonwealth Games stadium will start to appear to the left of it. 5) The brown brick buildings in the foreground are part of Manchester University - Which faculties do they house? E-mail info (at) aidan.co.uk In the distance are the buildings of ICL West Gorton - a computer company which has long associations with Manchester University. 6) In the distance is a square building which almost looks like a castle - I don't recognise it - do you? E-mail info (at) aidan.co.uk. MEMORIES OF MANCHESTER is packed with fascinating photos, many from the 1940's and 50's. 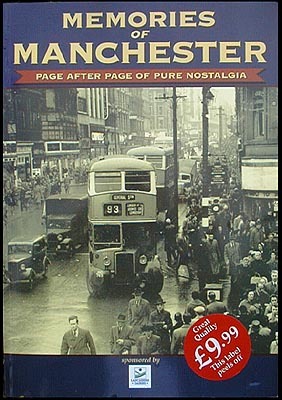 "Page after page of pure nostalgia" says the cover, but for me it's a glimpse into the Manchester that was lost - a Manchester which could have been preserved, and restored and developed. The cover photo, for instance, shows Market Street from the corner of Cross Street - looking towards Piccadilly. All the buildings on the left, with their interesting and varied facades, and those visible on the right, were demolished to make way for the Arndale Centre, with its grim and monotonous tiled exterior. There are many fascinating aerial photographs of Manchester City Centre, showing the bomb sites which would later be developed with modernist-style high rise buildings. The book also features the history and development of many local businesses. It's a fascinating book and I strongly recommend it. Many of the photos are taken from the collection of the Local Studies Unit at Manchester Central Library.